Some animals are called sentinel species because they act as local monitors of contaminant levels. Contaminants accumulate in their tissues through feeding and surface contact. Tissue concentrations of chemicals consequently indicate environmental concentrations. The blue mussel (Mytilus edulis) is a sentinel species that is common throughout the Gulf of Maine and is easy to identify, collect, and process. It has environmental requirements and a feeding mechanism that make it a useful indicator of chemical concentrations in the environment. It is long-lived and sedentary, which means that its body burden of contaminants reflects local environmental conditions over time. It feeds by filtering seawater to remove tiny plants and animals. As a result, mussels are essentially “living filters” that serve as natural sampling devices throughout the coastal zone. The blue mussel is widely used in other environmental monitoring programs and in laboratory and field toxicity studies, and it is commercially important. Scientists have a comprehensive understanding of its biology, physiology, and tendency to uptake and store chemical contaminants in its tissue. How do mussels filter food from the water? Blue mussels pump seawater past their gills to filter out food items and other suspended particles. They release filtered water back into the environment. Materials retained by a mucous material on the gills—including tiny organisms, detritus, suspended sediment, and contaminants—are eaten and then assimilated into their tissues or passed through their bodies undigested. Some contaminants such as mercury and PCBs bind to proteins or lipids and are stored in animals. Microbes, algae, and plants, which form the base of the food chain, can take up these contaminants directly from the water and sediment. 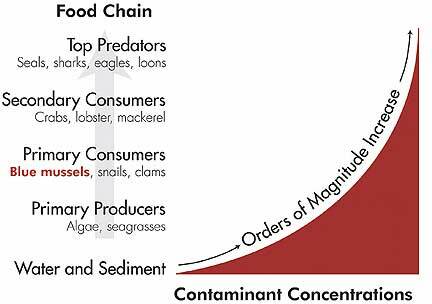 Contaminant concentrations increase with each step of the food chain because they accumulate in tissues faster than they can be metabolized—meaning that top predators such as eagles, seals, or sharks are at great risk of health effects from such contaminants. Concentration of PCBs or mercury can be over a million times higher in tissues of top predators than in seawater. High levels of mercury and PCBs in mussels from the Gulf of Maine are a concern. Because blue mussels are low in the food chain, high tissue concentrations of mercury and PCBs in mussels are a warning sign that top consumers, including humans, may also be at risk. Biomagnification, or accumulation of contaminants, in the marine food chain. Actual concentrations depend on the contaminant and a complex interaction of physical, chemical, and biological variables.